Log Cabins - Still the most popular garden building there is. Great value for money, yet retaining a natural feel. Any garden can cope with the addition of a log cabin whether it is used for storage, a summer recluse, garden office, kids den, the list is endless. 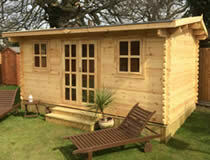 Our range of cabins include the budget range constructed from a 34mm log. Cheapest of the cabins, the 34mm versions offer great value and flexibility without compromising structural integrity. If considering a garden office or a building that will be used throughout the year, we would advise a log thickness no less than 44mm. These cabins come with double glazing as standard and if insulation is applied to the floor and roof, can be used throughout the year if a little supplementary heating is provided. Garden Sheds - With such a diverse usage of garden sheds you won't find a better range that will surely offer something suitable for your every need. Most sheds are still constructed from timber, but you are now getting more and more choice with plastic and metal options beringing with those characteristics that are not offered in a timber construction. Particularly with the plastic range, the most obvious benefit is the non-requirement to maintain an exteranl treatment to protect is from the elements. Plastic constructions will reman waterproof throughout their life, only requiring an ocasional wash to keep it looking in great condition. The shed range covers everything from upright and very compact tool cupboards all the way through to multi room summerhouses and garden storage in all three roof types, ie apex, reverse apex and pent. 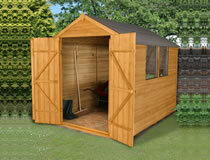 So take a look and find your ideal garden shed at a great price. Climbing Frames - Get the kids outside for some healthy and energy draining play on a climbing frame. You won't be disappointed with the Jungle Gym range, from basic units right up to the comprehensive and expandable Palace, this features a split level platform of 1.45m and 2.0m onto which is mounted a 3.0m slide, steering wheel, peekoscope and rock wall - absolutely fabulous - no child would get bored with this ! The Selwood range, manufactured from cedar wood incorporate multi level platforms, two seat glider swings and picnic tables to name but a few of the more unusual features. In all a great range of climbing frames to choose from, all priced to please. Go Karts - Great exercise, great looking and great build. 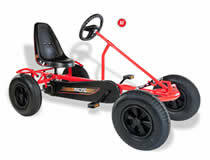 Our Dino Cars range of German built go karts are renown for their build quality giving years of trouble free karting. Apart from the Junior, all the chassis are of similar size allowing a user age range from 5 - adult, it will be the mind that is out grown rather than the size or capabilities. Our basic models have a rigid chassis and as you up spec, the chassis improve to have a floating front axle and even ball end joints on the steering rods. New to the range are the Quad bike look alikes and (my favourite !) the Tracks - heavy duty and ready to get rough and tough. Top of the range of go karts are fully featured and even have multi forward gears. Garden Decking - Here at Garden Adventure we love working with wood. Our expertise extends to the supply and installation of garden decking, a service we can offer across most of Sussex, Surrey and Kent. Take a look at our gallery page to see recent works where we have installed decking using all the major types of deck board including softwood, hardwood and our favourite, composite. "We have been very pleased with the quality of the cabin and the ease of construction. It was really encouraging to see it coming together so quickly. It has made a fantastic office and we wouldn't hesitate to recommend Garden Adventure to others." "Great product and excellent service. Just perfect!" "Very happy with this log cabin, which with relatively little experience we (myself and 20 year old son) put up to roof level in a couple of weekends (Thankfully the rain held off while we did it). Despite seeing previous comments about warped logs, virtually all of them locked in with little or no gap,- maybe 2 needed screwing down and we did not use the log screws on each log - as helpfully advised by Garden Adventure. So far so good. Eurovudas instructions are a bit basic, so one has to be prepared to improvise / make decisions on exactly where to screw in boards /window framings and how much to worry or plane down where the top of gables are not exactly level with side top wall boards. Also door and window handles hinges seem OK quality, previous comments read indicated they are not. Have put the cabin on separately screwed together 2*4 wooden frame siting on v.large concrete pavers, in turn on 1 ft concrete footings, so did not use the 9 Eurovudas 50mm sq bearers. " "Thank you also for a very prompt and professional service and obliging with the additional modification requested, we are very happy and a job well done - we've had some interest from the neighbours which is always a good sign and pleased to pass on a recommendation"